Every once in a while, an artist comes along who completely stuns you with everything they do. Every record, every performance, even interviews are inspiring. Anna Calvi is one of those artists. The musician, who received a Mercury Prize nomination for her last album ‘One Breath’, recently released her third long player; ‘Hunter’ after a huge 5 year break. 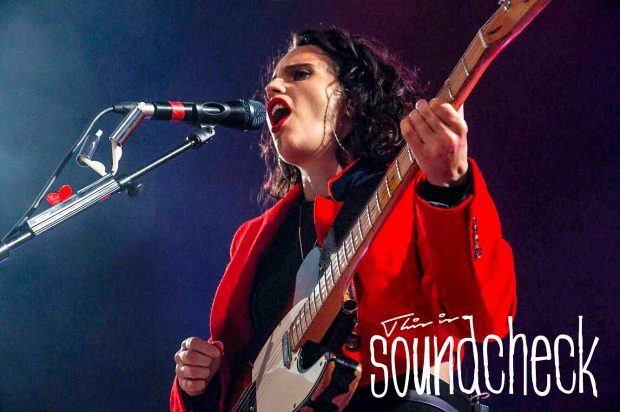 After a string of low-key intimate shows earlier this year and selected festival performances, Calvi arrived in Birmingham at the elegant Town Hall in the middle of a UK tour. The audience took a while to build up due to the support act being DJs in the form of; Youth Man and Sophie Galpin. DJs may not be everyone’s cup of tea, but these two provided a 45-minute set each of impressive hits mixed with obscure Euro-pop. Something a bit different for the average gig goer and highly entertaining. At a little just after 9pm, Calvi makes a poignantly slow entrance, picking up her trusty telecaster and begins to shred. And boy can this lady play! ‘Rider to the Sea’ is an impressive instrumental. Watching Calvi stand stage left and lose herself as she pulls notes from all angles of the guitar neck is something to behold. She returns to centre stage and performs ‘Away’ from latest album ‘Hunter’ completely solo. The drummer and percussionist join her for ‘Indies Or Paradise’ and the show elevates to a new level. There is no showboating, no egos, just the music speaking for itself. Anna’s vocals mix from the delicate gentle sighs through to full on rages within seconds as if she’s only taking a breath. Tonight we get ‘Hunter’ played out in full, albeit in a mixed up order. ‘Wish’, ‘Swimming Pool’, ‘As A Man’ and first single from the record ‘Don’t Beat The Girl Out Of my Boy’ are incredible live and take on even more of a life in the arena. ‘Alpha’ comes across as an instant highlight, it is dark, powerful, thumping and huge, and ‘No More Words’ is just a delight. Calvi’s debut single ‘Desire’ closes the main set and reminds you of why you fell in love with the songstress in the first place. It is defiant, euphoric and celebratory all in one and leaves the audience begging for more. Watching Anna throughout the whole show, you find a woman who is confident behind the guitar and puts everything in to the show almost as if it’s her last. She appears to be possessed as she steps away from the mic and loses herself in her art. Demonic and unsettling at times, but this is a performance. Incredible is the only way to describe the show. The encore sees a song from second album ‘One Breath’ in the form of ‘Suzanne And I’. You have to just wonder why she is not bigger, why with a performance of this scale she is not selling out bigger arenas. But, at the same time it is perfect. To take this show to bigger audiences could lose the intimacy, the anxiety and the power of the performance. Being selfish, to see Calvi in this environment is ideal. She finishes with a Suicide cover of ‘Ghost Rider’ which is flawless. Her vocals leading up to the cracking solo at the end which sees her almost becoming one with the guitar, lying on the floor whilst playing, entombing herself in the art is priceless. You can’t ask for more. Believing in ‘Hunter’ and sacrificing older tracks for the whole of the new album is a bold move and would not have pleased everyone, but in this instance, it was perfection.